This quote is the epitome of Seth Godin’s wisdom: pithy, accurate and makes sure to jump-start the reader into critical thinking. It encapsulates a common pitfall for meeting facilitators and organizers: jumping on consensus as full agreement within a group. It’s easy to ride the feel-good wave. It’s easy to take that and move on. However, it’s likely whatever is being decided on will not sustain itself long-term if it’s only buoyed by false agreement. This is why it’s so important to repeat the goals of the day or activity multiple times. This is why it’s important to take time to cultivate an environment where it’s okay to be vulnerable or to disagree (with curiosity rather than hostility, thank you very much CPD!). And all this is why bringing in a facilitator can make all the difference in the world when you’ve put resources into bringing your best and brightest into the room for the day, or even the hour. Having someone who asks the potentially uncomfortable questions, who takes a step back and clarifies what’s being decided, is exceptionally valuable. Bringing your people together for an important meeting? Let’s talk about how to avoid this pitfall and make some real decisions. Yep, you read that right! I had the pleasure of capturing stories from volunteers with the AARP at the Denver Botanic Gardens this week. I loved drawing their stories before their eyes and seeing faces light up when they recognized their sketch! Editing a video about Fire Adapted Communities, Journey Mapping for an international corporation, and illustrating a holiday card for a local foundation! 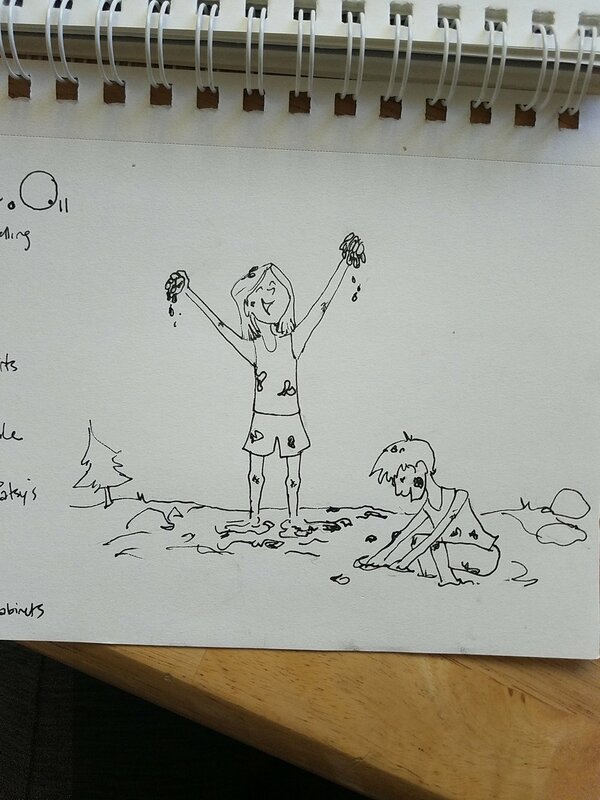 Since I don't photograph myself in the studio, here's a fun sketch I did for International Day of the Girl, celebrating adventures and mud puddles for girls everywhere! I hope this finds all you folks in the US happy and rested after the Thanksgiving holiday. My last newsletter focused on suspending judgement while brainstorming to facilitate innovation and creativity, with a promise to follow up this week with ideas to help you or your team make decisions and select the best ideas to move forward with. Okay, maybe you won’t end up completely blissed out if you use these ideas, but at least you’ll have a darn clear picture of what’s important to your team. Which is pretty much the same thing, right? A graphic recorder can often visually reflect where there is energy or consensus in the group through the illustrations they create, but what if you don’t have a graphic recorder, or the group is having a difficult time deciding? My first step is usually to have the group create Clusters. When brainstorming, I like to have participants write ideas on sticky notes – one per note – and post them on a wall. This makes it easy to move the ideas around into different themes or categories, which can then simplify or reduce the number of items you need to decide on or prioritize. Be sure to clearly delineate and name the clusters. Great, now we have a ton of awesome clusters. What now? Now, my friend, you have options (ironic, more decisions for you to make). Here are some of my favorite decision-making and prioritization techniques, in no particular order, and with endless opportunities to tweak to fit your needs or group. 1. The Dot Vote: A Classic. Chances are, you’ve used this at least once in your life…If the words “dot vote” make you want to run screaming from the room or throw the device you’re reading this on against a wall, please move on to Idea 2 immediately. However, it’s used often for a reason; it’s quick, can be used in groups of all sizes, and forces people to make tough choices. I usually give people multiple dot stickers so they can give their votes some weight: if you really love an idea, put as many dots on it as you’d like. If you are interested in several, spread your dots around. The caveat is that dot voting might mean an idea that will more heavily affect a minority of the group might get overlooked, even with weighted dot voting. Count the total for each option – the idea with the highest number of votes is the winner. 3. Selection Chart: Another Classic. When I need something more analytical and number oriented, creating a chart with options on the left column and criteria for ranking across the top can be useful. Decide on a scale for weight (i.e. 1-5, 5 being most important), and go through each option and give each criterion a number based on how important it is. Again, add up the scores for each option and you’ll get a winner and see distribution of importance. Bonus: You can do this individually first, then come together to discuss patterns or differences across the group. 4. Decision Trees (for inspiration & humor try this one): A la Dan Roam. Start with an important question, such as “Is dropping our price a good option?”. From there, ask and draw another, related question like “Is our market price sensitive?” decide yes/no, and if yes, ask another question, such as “How is our price relative to our competitor?”. If no, try another option since price isn’t a factor. And so on. Now get out there and make a blissful Selection Chart to decide which of these tools you’ll use next time your team needs to make a decision. Need someone to help your team make some decisions...then actually move forward together? Click to get in touch about your next meeting or event that could use a touch of graphic recording magic. I've Decided: We Should Talk! I'm proud to announce a new explainer video is out in the world thanks to the new One Health Institute at Colorado State University! Click the image above to learn how CSU's Dr. John Spencer is partnering with researchers and practitioners in Brazil to work toward ending leprosy!